Dutch Amnesty International launches propaganda campaign to make "Putin stop Assad"
In yet another politically-motivated move, the Dutch branch of Amnesty International has launched a petition campaign urging Russian president Putin to demand Syrian president Bashar al-Assad to stop what Amnesty describes as the “systematical use of horrible violence by Syrian government troops and militias in towns and villages”. 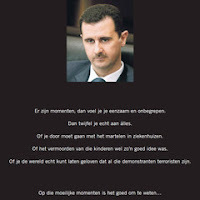 The site writes in Dutch language: People are dragged out of their houses and are summarily executed. Prisoners are tortured, sometimes to death. The Syrian army surrounds cities and incessantly bombs and shells them. There also took dozens of massacres place in which children were murdered in cold blood. This violence has to stop now! Russia blocks the UN Security Council and thus prevents any possible solution. Russia continues to supply arms to the Syrian regime. Russia is against the departure of president Assad, against military intervention and against an arms embargo. Ask Russian president Putin to take responsibility and to use his influence to end the violence in Syria! A fatherly-looking portrait of Russian president Putin appears, together with the words: You’ve got a friend. The video is not only ridiculous, shameless and full of intelligence-insulting lies; the so-called human rights organisation also failed to include the fact that the Syrian rebels, who obviously are allowed to continue to murder rampantly, are receiving weapons and millions of dollars from U.S. – and Dutch – allies and notorious human rights abusers Saudi Arabia and Qatar, which weapons according to a diplomat in Ankara are transported to Syria via Turkey with the implicit support of Turkey’s intelligence agency. In May rebel sources already revealed Turkey is training Syrians in Istanbul. A Russia Today report earlier this month mentioned the armed Syrian opposition has got their hands on chemical weapons which they acquired from Libya. They allegedly plan to use them against civilians and pin the atrocity on the Assad government. Meanwhile the CIA is said to aid in steering arms to the rebels. On May 25, Houla was attacked by hundreds of bandits and mercenaries. Ar-Rastan-based and Free Syrian Army terrorists were responsible. Civilians abandoned the town of Ar-Rastan. Lebanese Wahhabi/Salafist extremists dominate the area. With foreign money and weapons, they carry out terrorist attacks. When killer gangs entered the lower checkpoint in the center of Houla, they attacked pro-government residents. Many of those killed were ‘guilty’ of daring to change from Sunnis to Shiites. They were murdered in cold blood with knives or shot at point blank range. Scandalous accounts blamed Assad. Government forces and/or supporters had nothing to do with it. Militants opened fire on virtually everyone who tries to get closer to (Houla). Before us a UN convoy was fired upon and two armored jeeps of the UN observers were damaged, when they tried to drive up to an army checkpoint in Tal Dow. Many of the militants are professional snipers. Bandits even fired an automatic burst on our group of journalists. About 108 civilians were killed, including 38 or more young children. They were executed in cold blood. They were pro-government loyalists. In this new series of propaganda stunts Amnesty International joins fellow Soros-sponsored ‘civic organisation’ Avaaz who earlier this month took advantage of the horrible Houla event to urge the U.N. to send at least 3,000 international monitors to Syria, as well as idiotic initiatives such as Adopt a Syrian rebel and help oust President Assad for just $1 a day.